Here, a three layer vanilla peach cake with honey buttercream frosting, for Robert's 26th birthday. He's been telling me for the past few years, albeit with a healthy tone of sarcasm that he'll be his coolest when he's 27, so here's to one more year of practice before he gets there. I am happily in charge of the baking that goes on in our kitchen. I was thinking back to the one time Robert baked for me, he made one giant chocolate chip oatmeal cookie that filled an entire baking sheet. He cut out most of the butter, sugar, you know the unhealthy things that make it so delicious, but the best part was it still tasted really good. I am constantly going back and forth on the cutting of those ingredients. The more I bake, the more I've realized it's all about balance. I like to cut sugar and different fats where possible, but a thing that I've learned about myself is I'd rather have a small, appropriately sized portion of the full fat dessert, than a large portion of a low fat imitation. Life is short, have some cake. Peaches are one of Robert's favorites this time of year, and he's a big fan of the bare bones, classic birthday cake. I jumped on that bandwagon when his mom made me the smitten kitchen "best birthday cake" a few birthdays back and I've requested it ever since. Robert's sweet tooth is not nearly as big as mine, so I knew when he went back for seconds and thirds of this that it was a keeper, and I'd certainly have to make it again. 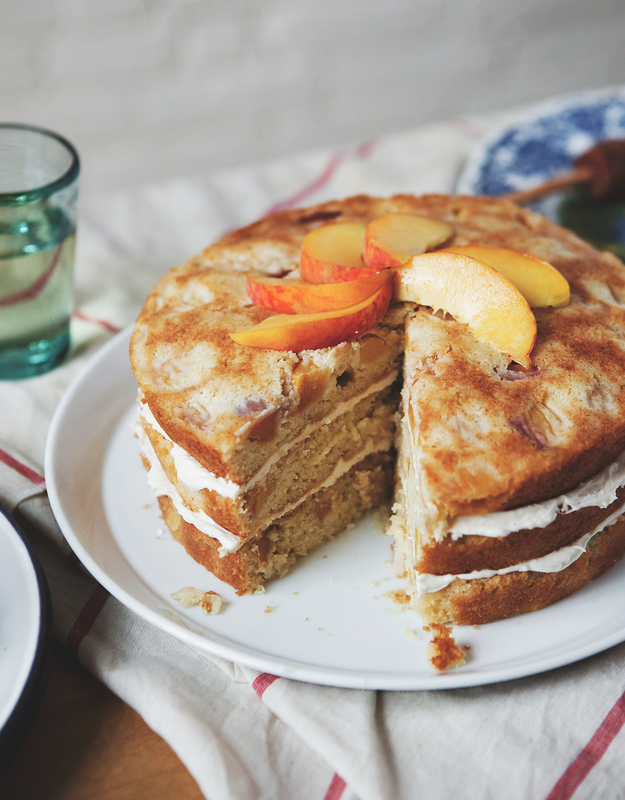 There's a big hint of that classic vanilla cake flavor, and the peaches make it perfect for summer. I'd serve it with blanc de blanc, because life is also too short to not have something bubbly with your birthday cake. Preheat oven to 350°. In a large bowl, sift together 2 1/4 cups cake flour, baking soda, baking powder, and salt. In another bowl, chop the fresh peaches into chunks and toss with ¼ cup flour and set aside. Using a mixer, cream the butter and sugar until light and fluffy. Beat in the eggs one at a time. Add honey, vanilla, and sour cream; continue to mix until fully incorporated. Pour the dry ingredients into the wet and stir until smooth. Fold in peaches. For a three layer cake, divide the batter evenly between 3 9”x 2” cake pans. Bake for 25 minutes, until edges have browned and the cake is cooked through. Cool the cakes completely on wire racks before frosting. Using an electric mixer, cream the butter and honey until smooth, about 3 minutes. Add powdered sugar ½ cup at a time, scraping the bowl as you go. Add salt, continue mixing until fully combined. *Note, I found that 1 ½ cups powdered sugar was perfect for desired flavor and consistency. For a slightly thicker and sweeter frosting, you’ll want to add the full 2 cups of powdered sugar.